Hearts of Life Animal Rescue Dog of the Week-Meet Joe! Meet Joe! 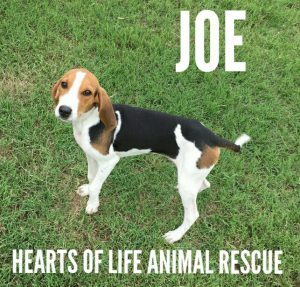 Joe is approximately 4 months old and is believed to be a Treeing Walker Coonhound. Joe is very smart and very playful. His adoption fee is $100.00 which includes all previous vetting, neuter & rabies shot. If you would like to meet him or have any questions, please call Hearts of Life Animal Rescue at 903-439-5019, email adoptonenow@aol.com, www.facebook.com/heartsoflife or Petfinder.com!